Actually, that was pretty good. Pay no attention to other reviews that have been written. Before I Go to Sleep is a pretty good thriller–if you don’t mind thriller cliches, that is. 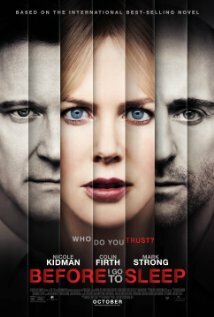 You’re neither going to witness Nicole Kidman’s nor Colin Firth’s best or a good performance, but you will get a fun thriller to watch this weekend. It basically follows suit with the rest of the October movies, in terms of cinematic quality, with the likely exception of Nightcrawler (from what other critics have written). Although I haven’t seen it yet, I plan to this weekend or next week. As the credits role, you will most likely feel as if you sat through a Lifetime movie with A-List actors. Despite the many cliche moments, there is a great plot twist that I did not see coming. Since the movie is only 1.5hrs, it launches out the gate like a sprinter, and keeps up a good pace for the run of the film. Before I Go to Sleep is about Christine (Kidman) who suffers from a severe case of amnesia that causes her to lose her memories from any given day, while she sleeps, and wakes up feeling as if she is back to her 20s. Through her husband Ben (Firth) and a video diary, she is able to retain some of what she has learned each day. However, with the help of her psychiatrist, she uncovers something dark that could rock her world while she pieces together her past. The movie opens with a very Hitchcock-ian ECU (extreme closeup) on Chris’ eye. This shot is very reminiscent of the final shot of Marion in Psycho as the camera slowly spirals out from her lifeless eyes. Much in the same way the much more comedic 50 First Dates plays out, this movie features a similar concept of narrative exposition from loved ones, newspaper clippings, and photographs. However, this is a much darker story than the comedic counterpart. Over all the cinematography, direction, and screenwriting is par for the course for Lifetime-esque films. But, this IS a theatrical release, so it falls short of where it should be. The plot keeps you guessing and has you along for the ride from the very beginning. There are certainly unanswered questions like: why all of a sudden is she (Chris) able to slowly recall memories even though she has been stricken with severe amnesia for ten years? And, at what point did this psychiatrist become involved with Chris? She still lives in the same city where she had been prior to the accident, so why don’t friends ever come over or check up on her? I suppose, this is where one should employ the suspension of disbelief in order to enjoy this moderate thriller. Not at all Oscar bait, but could very well be Raspberry bait; it’s one of those films you watch for pure entertainment value and enjoy the ride, as “TV” as it is. Thankfully, it sticks to an appropriate run time of 1.5hrs, and will keep your attention as long as you like Lifetime style movies. And, this critic enjoys them from time to time. Happy Halloween!